Unless you're hitting the multiplex with a franchise project like a slasher picture with a final image that leaves your audience screaming in the aisles or a tested commercial product such as a super hero comic book movie, then making a sequel is an incredibly risky gamble. And needless to say when your original title is not only not a stereotypical “popcorn” picture but as in the case of Oliver Stone's Wall Street , a revered Academy Award winning classic that's become an iconic portrait of the decade in which it was released, the stakes are much higher all around. Yet unlike other Hollywood sequels that operate as mindless quickies offered to the masses with the same “greed is good” mentality preached by Wall Street 's shady Gordon Gekko wherein the ultimate goal isn't love but a fast bang for the almighty buck -- by waiting two decades to find a story that's timely, realistic, and worth telling -- Stone and his Street 2 scribes stacked the deck in their favor. The result is a stunning, sophisticated and largely successful sequel that reacquaints us with Gekko (Michael Douglas) upon his release from prison after serving a substantial sentence for a ticker tape long list of broken business commandments. Yet, as he can't help but muse later, Gekko's crimes were minor in contrast to the outrageous offenses being perpetrated on the American public by corrupt corporations in the twenty-first century. Although he's considered toxic in the trading circles of his former home base of movers and shakers that include many individuals with whom he'd mentored, worked or monopolized, he still knows how to captivate a crowd, lecturing university halls filled with a whole new generation of Bud Foxes, after publishing a book complete with a title that pays homage to the first film's most famous quote. It's on a college campus where he first meets Wall Street 2 's new young ambitious trader, Jake Moore (Shia LaBeouf) who informs Gekko that he's engaged to marry the man's estranged daughter, Winnie (Carey Mulligan). However, aside from the classic psychological theories about girls who marry their fathers, given the degree of her contempt for her father, it seems highly unlikely that the left wing, nonprofit online journalist scribe Winnie would ever be romantically involved with Jake. For despite LaBeouf's natural charm and Jake's interest in seeing an alternative energy company solve our global oil crisis and net him a fortune, the screenplay never fully provides enough back-story for us to understand their pairing. And fighting against our questions offscreen, onscreen the couple's relationship is otherwise tender, which was undoubtedly aided by the fact that actors LaBeouf and Mulligan were romantically involved during this period. Yet whereas Jake and Winnie seem like they would have nothing to do with one another in real life, because they're both turned on by the thrill of the mastering the money game, Jake's chemistry with Gekko is not only natural but so strong that it makes us overlook some of the plot contrivances. 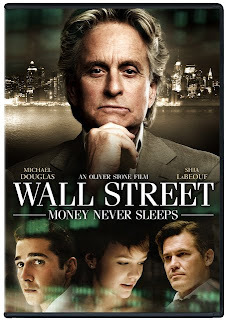 On the surface, Wall Street: Money Never Sleeps does share some of the father issues that appear throughout Stone's filmography, particularly in the original movie as two decades ago, Charlie Sheen's Bud Fox found himself torn between his honest blue collar father and his greedy mentor Gekko. Yet luckily the writers avoid the temptation to fall into the safety of repetition by parroting the tried and true formula of the first movie. This time around and rather than simply scheming for dollar signs, Jake's primary motivation is to outmaneuver the manipulative man (Josh Brolin) that he holds responsible for the death of his mentor (Frank Langella). Equally inspired by the idea of revenge and settling scores, Gekko begins to “trade” information and insight with Jake in exchange for what he hopes will be increased access to Winnie, who wants nothing to do with her father and is predictably unaware of their association (caution: conflict ahead). 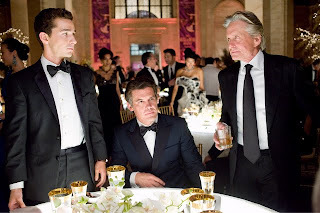 Although the ensemble elevates the material even in times of heavily foreshadowed crises, Wall Street 2 does admittedly hit a few false notes, particularly where Winnie is concerned as Stone and company have never been especially skilled at understanding or creating realistic female characters (e.g. Alexander ). Likewise, while once again the filmmaker's penchant for allegory in the editing room makes his points hit us with a staggering punch where a subtle nudge would've sufficed, one of the true revelations of Wall Street 2 is Michael Douglas' nuanced portrayal of a man we thought we knew. As a Douglas fan, Street 2 makes an unexpectedly terrific companion piece to 2010's indie feature Solitary Man , which also co-starred Street 2 's Susan Sarandon and ironically marked their first appearances onscreen together in their legendary careers. The two works were not only tailor-made for Douglas but also offer him the chance to do what he does best. 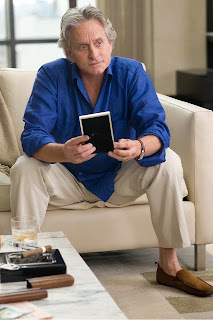 Namely, in Man he plays an aged variation on his amoral “Prince of Darkness” seducer roles (Fatal Attraction , Basic Instinct ), while Wall Street: Money Never Sleeps gives him a great opportunity to revisit his Oscar winning smug yuppie turn that perhaps typecast him as such in the first place. And although the film does fail Gekko and in turn Douglas by forcing a mind-blowingly corny conclusion on us by wrapping everything up with a big bow to solidify his bond with his blood in such a way that's decidedly out of character for His Greediness, before that point, Douglas manages to show us sides of Gekko that we never realized were there before. Unlike zebras that can't change their stripes, people can evolve over time. 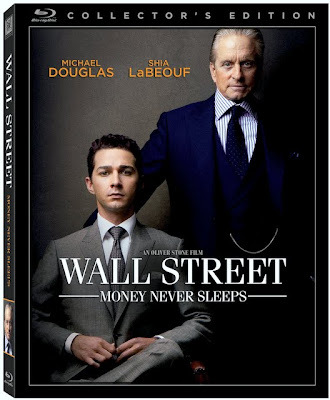 And while we have no doubt that there's no denying the old Gordon Gekko completely, Douglas' world-weary portrayal gives us pause and in turn adds more weight to the now fully fleshed out three-dimensional role of Gekko, deservingly netting Douglas a Golden Globe nomination for Stone's film. Similarly and far from some critics' first impressions that perhaps Street would be stuck in the '80s upon discovering that the great David Byrne and Brian Eno would be returning to soundtrack duty to add some color and flavor to Craig Armstrong's solid score, the musical compositions heighten the urgency and emotion of sequences. Thus, even for those of us who have no idea how brokers operate (like this reviewer), we soon feel as genuinely caught up in the trading floor and instant message computer action as the suits do onscreen. Transferred to a gorgeous theatrical style sheen and a superb level of crystal sonic clarity in a Blu-ray from Fox that includes audio commentary, bonus features and a digital copy of the film, Wall Street 2 may not have the immediate visceral impact of the brilliantly simple original work but the ambitious, complex, multi-layered narrative complete with dual plotlines and five dynamic characters is an investment well worth your time.